Offering homestay accommodation for foreign visitors to the Beijing Olympics of 2008. 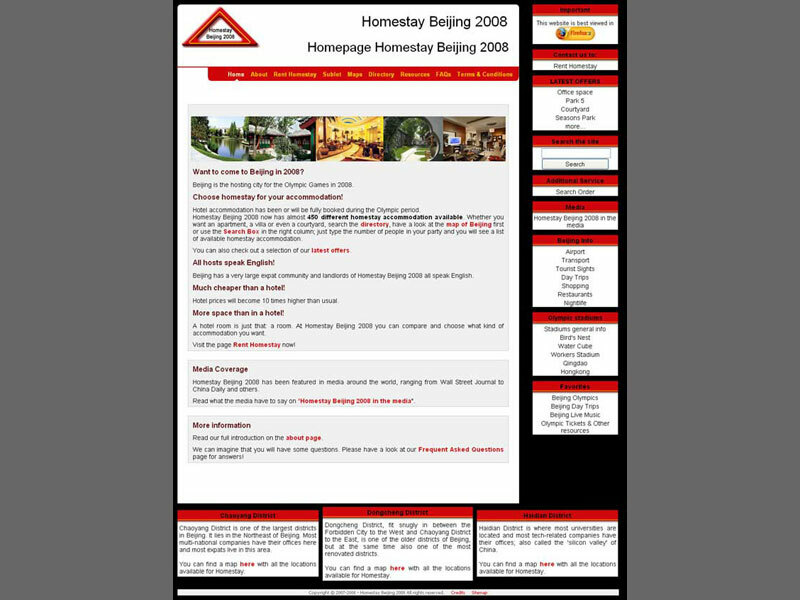 One of the projects we did in the run to the Beijing Olympics in 2008, was Homestay Beijing 2008, dedicated to arrange alternative homestay accommodation for foreign visitors to Beijing. With this website we gathered a huge amount of local, domestic and international media attention. Because we were not as well-versed in WordPress as we are now, we hand coded the entire site including special Google Maps with not only homestay locations, but also locations of all Olympic venues. To build the site we used an open source template and adapted that to our wishes. It basically was a 2 column website with 3 columns for the bottom content. Naturally Google Maps was fully integrated for district maps and listings, not only with the exact location of the homestay addresses, but also with the locations of the Olympic Stadiums, various tourist sights, tourist friendly shopping centers and all major subway lines. Each listing had its own photo album and the site had several different contact forms and application forms. Payments were all done via international bank transfers, so we didn’t need any integration for that aspect. The site served its function very well and due to some mishap unfortunately is no longer online.